Growing up, Mom worked long hours as a nurse and often did not get home until late. As a result, my sister and I became pretty proficient in the kitchen at a young age, and loved to surprise Mom with dinner when she got home. 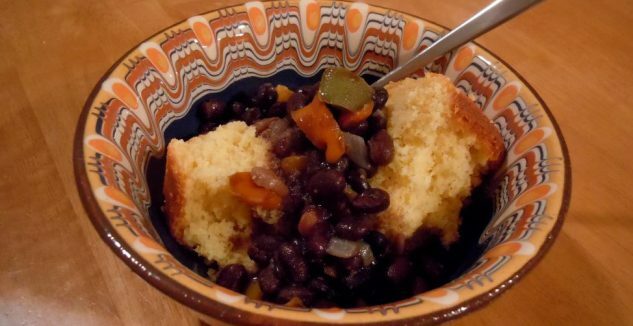 One of our favorite meals to prepare was a ‘chili and cornbread’ dish that harkened back to our grandparents’ youth in Oklahoma. We loved eating cornbread in all forms: with chili or other beans for dinner, smeared with butter and honey for dessert or even soaked in milk for breakfast the morning after. This recipe comes to us from FDP’s own Joanna Gallagher. Serve with the cornbread cut in a square and sliced in half so that the soft, textured insides face out. Heat the chili in the microwave and pour it on top. Microwave green beans and serve on the side. Heat the vegetarian chili in the microwave and pour it on top.